The Wyoming Sponsor A Highway® Program has officially launched and today we celebrate the very first business that has joined the program as our newest Sponsor! In 2015, the Wyoming Department of Transportation (WYDOT) and Adopt A Highway Maintenance Corporation® (AHMC) partnered to launch the very first corporate sponsorship program in the state of Wyoming. Wyoming Sponsor A Highway® provides businesses with an opportunity to sponsor roadside cleanup at an affordable price. The program helps WYDOT keep the highways safely maintained and also provides businesses with positive exposure for their involvement in the program. Today we are celebrating our very first sponsor; the Hilton Garden Inn, located in Laramie. Their sign, which is located off highway 80, was officially installed last month and the Hilton Garden Inn is already reaping the many benefits of becoming a sponsor. The Hilton Garden Inn is connected to the UW Conference Center its contemporary hotel is less than 2 miles' drive from downtown Laramie. All rooms offer custom-designed beds, plus flat-screen TVs with premium cable, microwaves, minifridges and free WiFi. Executive rooms and suites add separate living areas and suites have whirlpool tubs. A cooked-to-order breakfast is available (fee) and there's an on- site American restaurant, as well as a bar and a 24/7 pantry. There's also a fitness center, an indoor pool and a kids' pool. Additional amenities include multiple meeting rooms, a business center and free parking. 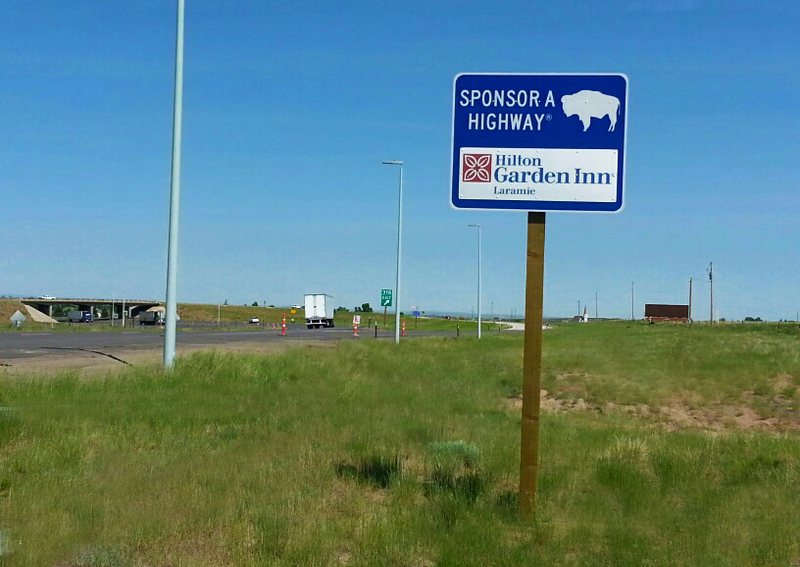 Benefits of the Sponsor A Highway® Program for businesses that sponsor include exclusive sign locations directly along some of Wyoming’s busiest highways, brand awareness, increased overall exposure, and improved community relations; all at an affordable price. For more information on how you can join visit http://www.adoptahighway.com. Adopt A Highway Maintenance Corporation® (AHMC) provides litter removal and quality roadway maintenance nationwide for local businesses and Fortune 500 companies such as Anthem Blue Cross, McDonald’s and The Walt Disney Co. AHMC began in California during the 1990s and has now earned contracts within 20 different states. AHMC partners with the Department of Transportation to acquire permits and contracts necessary to ensure that crews consistently clean America’s busiest highways. The company has outdoor signage opportunities that can increase sales with branding of the company name and logo displayed for thousands of motorists to see daily. For more information, please visit AHMC’s website at http://www.adoptahighway.com.